Infernale Pizza: cherry tomatoes, fior di latte, wood fire roasted eggplant, spicy Sopressa salami and chilli. 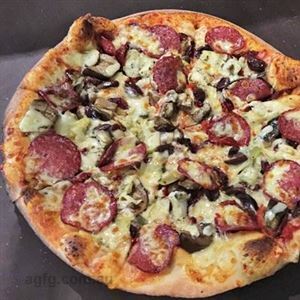 Named after the King of Naples, who would sneak out of the palace to eat pizza, Ferdinand on High Street in Northcote fulfills cravings for tasty Italian fare. This sleek, trendy hangout mixes shiny, black tiles with wooden furniture and rectangular brass lights, exuding a chilled out vibe ideal for a leisurely meal. 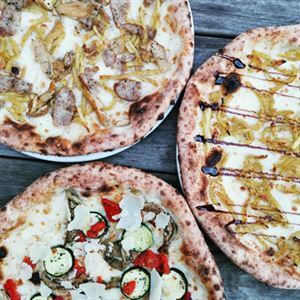 In warm, sunny months dine alfresco in the brick courtyard, with a glass of vino in hand and take in wafting aromas of pizza cooking in the woodfired oven and pasta like Nonna used to make. On offer are must haves like deep fried whitebait served on a bed of mixed greens, or the Ferdinand pizza, with San Marzano tomato, buffalo mozzarella, cherry tomatoes, prosciutto and fresh basil. Pasta lovers can twirl a fork around pennette, cooked in a basil, pine nut and Parmesan pesto.